One of the most beneficial pieces of swimming pool equipment to convert to an energy efficient model is your heat pump. An energy efficient heat pump can utilize up to 45% less energy compared to a standard model. One of the main differences that sets an energy efficient model apart is that it transfers heat rather than creating it. This means that it collects heat from the air or atmosphere. Use a heat pump timer so you can have it run in a particular cycle or several times in a day instead of operating them continuously. Some energy efficient heat pumps can also work as a filter. Hence, you can lessen the use, wear and tear, and energy draw of your standard pool filter. Using solar pool covers can guarantee less heat loss. Solar pool covers can trap as much as 80% of the waters heat overnight. They block the outside air from the water thereby minimizing evaporation, eliminating heat waste and reducing the amount of time necessary to run your heat pump. Without a solar pool cover, your swimming pool could potentially lose as much as 50% of heat and water through evaporation. Pool covers can also help keep your water clean by keeping debris from making its way into the pool. This would mean lessening the number of times you operate your filter pump, thereby saving more energy. 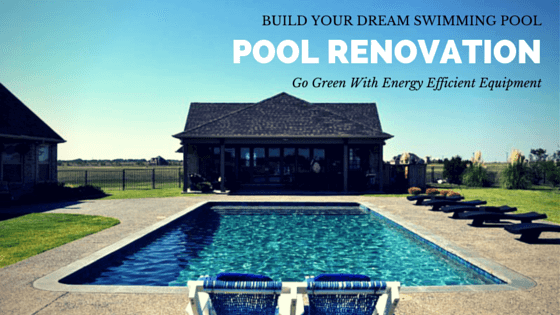 While lighting obviously enhances the look and feel of your swimming pool, it is another energy draw. Choosing energy efficient lighting will help to conserve more energy. Some energy efficient lighting options even have sensors that can detect if it’s night or day, and will automatically turn on or off accordingly. Energy efficient lighting can reduce energy consumption by as much as 35% to 60%. When opting for energy efficient swimming pool equipment, remember that it’s not just money that you’re saving but you’re doing your part to help save our planets precious resources.